Books posing together for a photo. Bookshops display bestsellers and attractive fiction, making book selection easy and pleasant. Academic libraries, on the other hand, have fiction integrated with literary criticism and it’s not always easy to just walk in and find a novel to read. Notre Dame’s Hesburgh Library has a great collection of Irish fiction, but identifying authors and books in the catalog takes time. 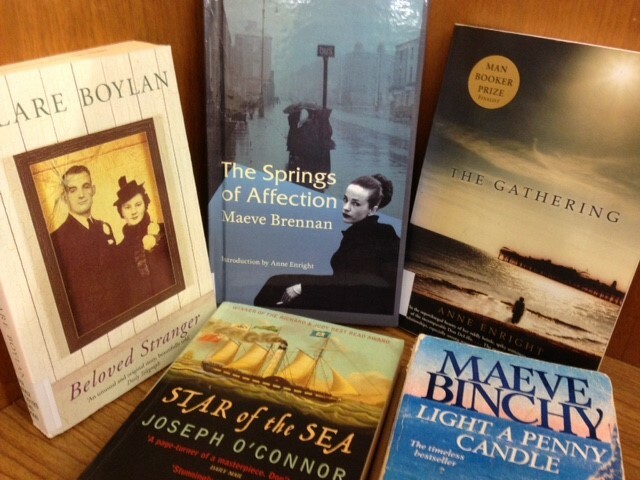 So this list is a selection of Irish fiction available for loan in the Hesburgh Library. Banville, John. The Blue Guitar. PR 6052 .A57 B595 2015. Baume, Sara. Spill Simmer Falter Wither. Bolger, Dermot. Lonely Sea and Sky. Dunne, Catherine. The Years that Followed. Enright, Anne. The Green Road. Howard, Paul (Ross O’Carroll-O’Kelly). Rhino what You did Last Summer. Jordan, Neil. The Drowned Detective. McBride, Eimear. A Girl is a Half-Formed Thing. McKinty, Adrian. Dead I Well may be. McNamee, Eoin. 2014. Blue is the Night. Ní Chonchúir, Nuala. The Closet of Savage Mementoes. O’Brien, Edna. The Little Red Chairs. PR 6065 .B7 L58 2016. Ó Cadhain, Máirtín. Graveyard Clay. O’Farrell, Maggie. The Vanishing Act of Esme Lennox. Ryan, Donal. The Spinning Heart. 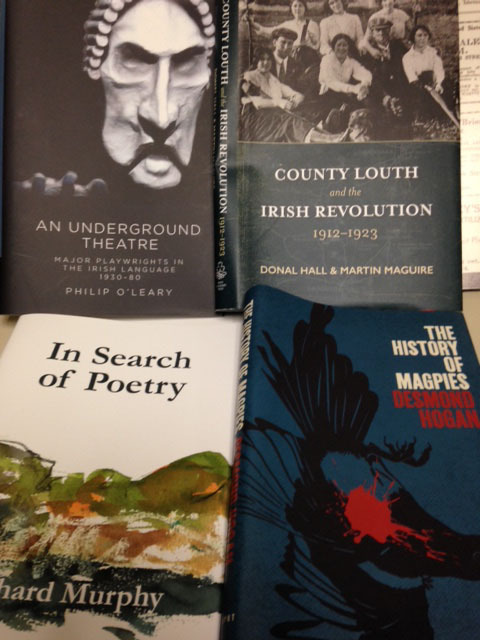 Newly-published books continue to arrive from our vendors in Ireland and the U.S. during the summer. The Fenian Cycle in Irish and Scots-Gaelic Literature. Rebel Kerry: From the Pages of ‘The Kerryman’. Simon Brouder, ed. Mercier Press, 2017. DA 962 .R43 2017 (currently shelved in the New Book Area, first floor). Time Pieces: A Dublin Memoir. Douglas Hyde: The Professor of Irish who became President of Ireland: Proceedings of Seminar Held to Explore Aspects of the Life and Achievements of Douglas Hyde, the First President of Ireland. A.E. (George William Russell). Daniel Mulhall. Swan River Press, 2017. PR 6035 .U7 A6 2017 (currently in the New Book Area, first floor). Stewart Parker. Ed., Marilynn Richtarik. Lilliput Press, 2017. Special Collections (MR) Medium PR 6066 .A69 H66 2017. July Parsons. New Island, 2017. Special Collections (MR) Medium PR 6066 .A7177 T54 2017. The last two books are part of the Irish Fiction Collection, and are available for reading in the Special Collections Reading Room.